It's a gaming month at the Scooter household. 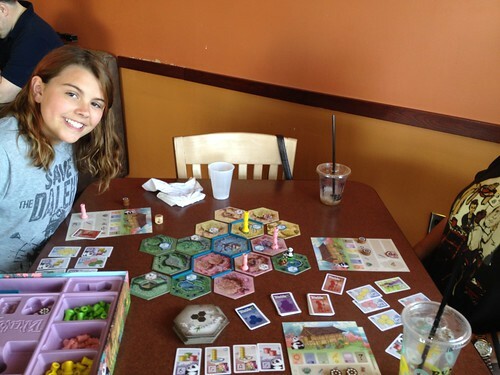 Eryn wanted to learn how to play Settlers of Catan, so we had it out. 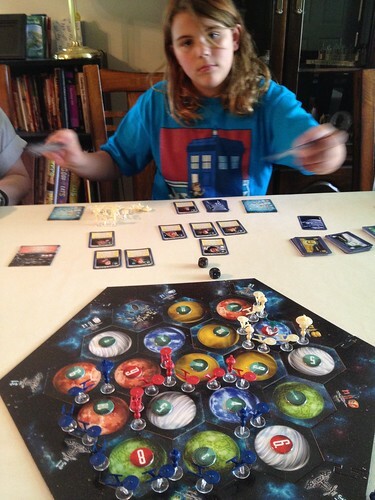 She has a serious sci fi bent (hence the t-shirt) so as an elementary graduation, I agreed to get her Star Trek of Catan, even though it's almost exactly the same game with the exception of the look and feel and the officer cards. I want to make my own officer cards. I know they're all supposed to be Starfleet officers, but there should really be a Khan card. And the crazy officer from the the planet-killing unicorn horn episode...um...Decker. Doomsday Machine. Him. Maybe he'd destroy one starship. 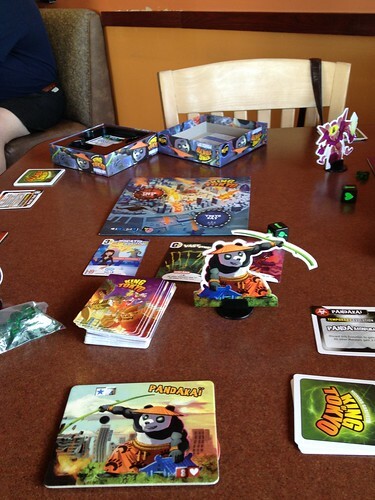 We also have been playing King of Tokyo with the Panda Kai expansion. I like playing The King (Kong), although Panda Kai is fun too. I don't seem to get the mini-evolutions much and they who taught me how to play taught me it was either-or when you got three hearts, but it's really both (healing plus evolution). A big difference. And Kyle got Eryn Takenoko for her birthday. A great game that's a lot like Catan, but with a hungry panda, a frustrated farmer, and an emperor. This one deserves an expansion, but I'm not sure what. It seems like it would be simple to add one more character with a deck of goal cards. Princess? Samurai? Philosopher - he could add rocks that limit bamboo growth, all Tai Hu style. Or perhaps a governmental worker who taxed the bamboo. A sage? Perhaps that's pretty much a philosopher. The goal could be to get # sages to a particular color of bamboo grove. That would be very Japanese. 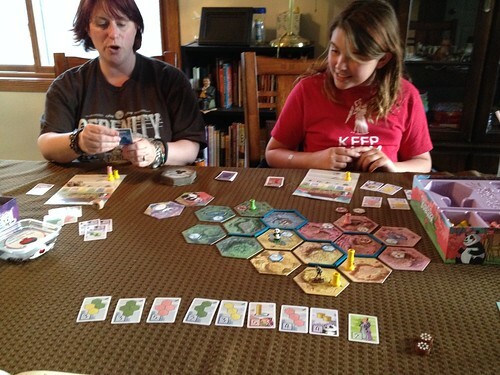 Another picture of Takenoko, well into the game.